VISHAY Intertechnology, represented by Braemac , has announced its first family of surface-mount thyristor surge-protective devices, which provide exceptional clamping performance with bidirectional "crowbar" protection, maximum breakover voltage values ranging from 70V to 395V, and surge capabilities up to 100A. Surge capabilities of 50A (10/1000µs) are available for devices in both the SMA and SMB packages, with values up to 100A (10/1000µs) available in the larger SMB package. Used as direct replacements for industry-standard devices with the same part numbers, Vishay's new ThyZorb products offer clamping specifications as much as 10% better. Lower breakover voltages and a fast turn-on time reduce "let-thru" voltages that may damage sensitive telecom circuits. A very low typical leakage current of <50nA is another advantage of ThyZorb devices. The minimum holding current for the ThyZorb devices is 150mA, with a stand-off voltage range from 55V to 320V. While avalanche-type transient voltage suppressors that share the same size and voltage rating will clamp at a given breakdown voltage, the new ThyZorb thyristor surge-protective devices feature a crowbar action that enables switching from a high-impedance, high-voltage "off" state to a low-impedance, low-voltage "on" state, which in turn allows the devices to redirect current surges to ground. Because the voltage across the ThyZorb device collapses when the voltage and current exceeds a predetermined breakover level, the device can handle significantly higher levels of surge current than an avalanche-type TVS. 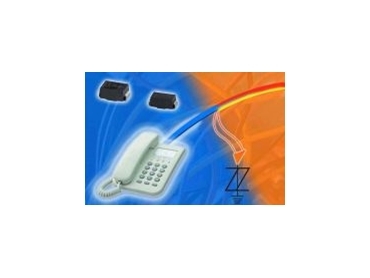 With this ability to handle very high surge currents in the compact SMA and SMB packages, ThyZorb devices offer highly effective solutions for secondary protection against lightning and ac-induced transients in telecommunications equipment such as telephones, fax machines, modems, central switching and network equipment, and analogue and digital line cards including xDSL, T1/E1, and ISDN. The compact, low-profile SMA and SMB molded plastic packages have UL Flammability Classification 94V-0 and feature built-in strain relief for high reliability in surface-mounted applications. They comply with major international regulatory standards, such as IEC-1000-4-5, GR-1089-CORE, IEC6100-4-5, ITU-TK20/21, and FCC Part 68. All of the new devices are offered with exact competitor part numbers to simplify cross-referencing. Samples and production quantities of the new SMP50, SMP100LC, PxxxxSA/A/AA, and SMTPA series ThyZorb thyristor surge-protective devices are available now.